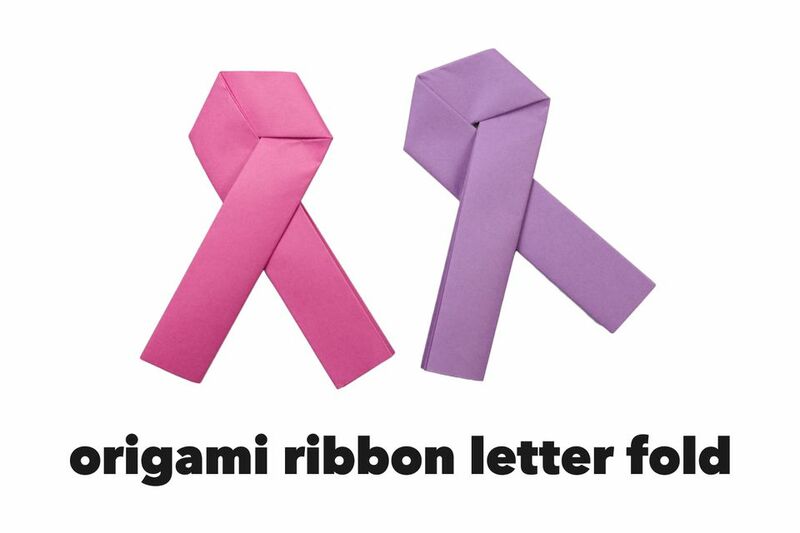 Learn how to make a traditional origami letter fold, this one looks like the ribbon that is used for the Breast Cancer Research Foundation & the Aids Foundation. This traditional origami letter fold has been around for a very long time, and you will see this particular letter fold being passed around behind teachers backs in class (in Japan)! The Breast Cancer Foundation ribbon is pink, but there are many other different colored Awareness Ribbons. If you are making an Awareness Ribbon for your cause, you could make the first horizontal fold, (step 5+6) a bit more to the left, and then the fold on the right, should be further to the right, this will give you an open loop at the top. We think this origami also resembles the wishes that are left on bamboo trees at Tanabata (the Japanese Star festival). For more envelope themed photo tutorials, check out the origami square letter fold and origami envelope box tutorial, how to make origami envelopes! and learn how to make some super easy envelopes!. A very useful origami is the easy origami business card case or wallet. 1. Start with the paper white side or with the writing facing up. 2. Fold the bottom edge up to the top. 3. Fold the bottom edge up to the top a second time. 4. And again, for a third time, fold the bottom edge up to the top. Flatten this out nicely as this will effect the end result. 5. You will be folding the left end down to the right, we have mark about where to fold. It is not the middle, but it leaves enough of a gap for the right edge to be folded down too. 6. Fold the left end down to the right. 7. Holding the right end and flip it behind, and then in front of the other end. 8. Flatten it out and straighten the edges. We didn't get this looking great the first time, after a couple of tries, it will improve. Remember that it's only going to be opened out again! We hope you enjoyed the tutorial!